With British Airways’ new direct flight from London Gatwick to San Jose, it has never been easier to travel to Costa Rica. Being one of the smallest countries in the world, it has by no means less to offer. Even though it’s one of the world’s smallest countries, it packs a punch with what it has to offer; beaches, adventure and nature with the highest biodiversity density in the world. Perfect for families, friends or couples. Costa Rica works for travellers from hard-core adventurers to sun lounger lovers. 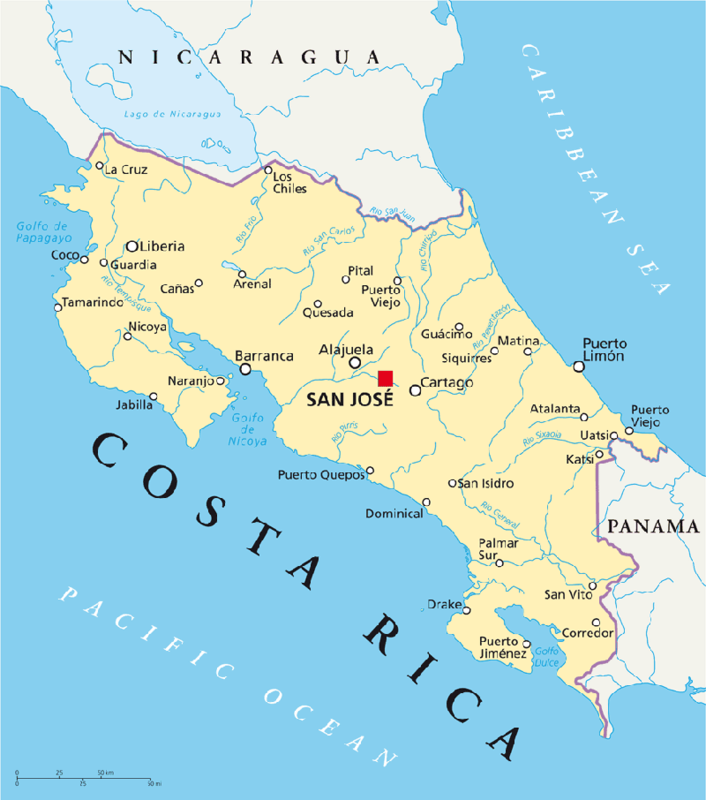 Bordered by the Caribbean and the Pacific Oceans, and split in two by a chain of volcanic mountains, Costa Rica’s varied terrain encompasses dense jungle, lush rainforest, misty cloud forests, mountains, glorious beaches, mangrove estuaries, hot sulphur springs with bubbling mud pools, dry forests, freshwater swamps, clear azure waters and coral reefs. These habitats are home to an incredible array of flora and fauna, with fabulous birding – sharp-eyed guides will help you spot them camouflaged in the forest. Inland, a whole host of activities are available including trekking, birding, water-rafting, rappelling, canopy walking, horse-riding, swimming in warm natural springs or waterfalls, touring plantations, climbing volcanoes and kayaking are just some of the activities on offer. While the Pacific and Caribbean coasts offer humpback whale watching (an almost all year round activity), snorkelling and diving the pristine coral reefs, deep-sea fishing, catamaran sailing and surfing. Costa Rica has a good range of hotels, retreats and private villas to suit all budgets and styles. Spending a few nights in each region is the best way to appreciate and experience the country’s incredible diversity. Here, you’ll find the Arenal Volcano, the most active in Costa Rica. It is often the first stop on any itinerary and you can spend a couple of days exploring the National Park with nature walks, rafting along the windy rivers of the rainforest, horse-riding, kayaking and exploring underground caves. For birders, Monteverde, north of Arenal is a must. Take a boat taxi across Arenal Lake to arrive at the cloud forest – home to hundreds of species of birds as well as butterflies, plants and mammals. Perhaps you’ll spot a Quetzal, the tropical bird famed for its bright colouring. If you have a head for heights, take advantage of the region with exhilarating zip-line canopy tour. Whatever you choose to do, make sure you sink into natural hot springs at the end of the day. The Pacific Coast has miles of magnificent, picture perfect, sandy beaches for you to kick back and relax. For the most remote beaches, smaller boutique hotels and characterful private houses head to the southern part of the coastline. Puerto Viejo is a fun Caribbean coastal town with superb beaches and great surfing. Further north along the coast is Cahuita National Park – 2,700 acres of rainforest, mangroves, beach and marine life, this is the destination for outdoor activities; go on bike-rides, birding, hikes on nature trails, scuba diving and snorkelling. Continue north to Tortuguero National Park and travel through vast network of freshwater canals and creeks by canoe and kayak. Immerse yourself in nature and learn about your surrounding from experienced local guides. Time your arrival from the end of July to mid-October to see the spectacle of turtles coming ashore to lay their eggs. December – April is the dry season with clear skies and warm temperatures. May to November is the green (wet) season, where tropical rains occur for a few hours in the afternoons, but expect bright and sunny mornings, so still a great time to go. The Caribbean Coast has an opposite weather pattern to the Pacific, so visit June to October for dry weather and January to March which is dry with a touch of rain.